"Fracking" the cause of two minor quakes? A British mining company abruptly stopped drilling after scientists raised the alarm that its work may have triggered two recent minor earthquakes in northwest England. Cuadrilla Resources immediately -- and voluntarily -- suspended its operations to extract shale gas in a controversial process known as 'fracking,' reports CBS News correspondent Charlie D'agata. Cuadrilla bosses aren't denying their drilling may have caused the tremors, but they're downplaying their significance. "'Earthquake' is a very wide-ranging term," says Cuadrilla CEO Mark Miller. "It means -- when we hear about earthquakes, we think about places like Japan and New Zealand; we don't often think about these events that are so small that it takes special monitoring to see that they even happened." Hydraulic fracturing -- or fracking -- involves pumping high-pressure water, sand and chemicals deep into shale -- layered rock formations. 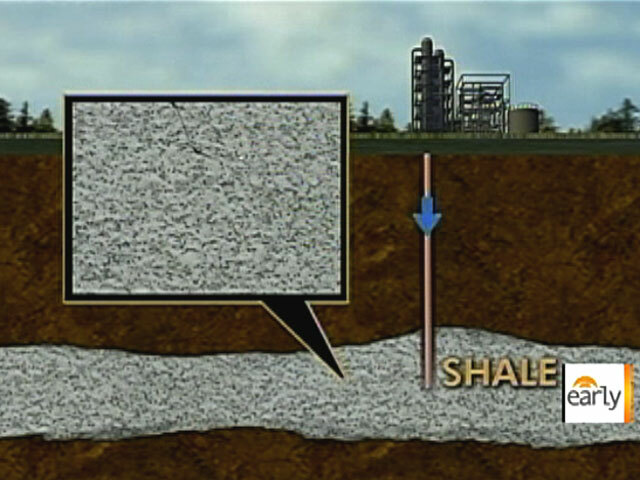 The build-up of pressure forces the rocks to fracture, releasing trapped natural gas that is then collected on the surface. But a little seismic activity in Britain is nothing compared to the controversy fracking has caused in the United States. The biggest worry is whether the cancer-linked chemicals used could pollute water supplies. The possible health risks were the subject of the 2010 documentary "Gasland," which focused on Dimmock, Penn., where fracking operations were under way. Residents there said the high levels of methane gas found in tap water turned it flammable. But experts say the extraction of shale gas could boost global natural gas resources by 40 percent. As in the U.S., European nations have been looking for ways to lessen their reliance on imported oil and gas. Poland has announced a major investment in shale gas to break free of dependence on Russia. And their efforts were backed by President Obama during his visit there last weekend. "Shale gas is an important opportunity," Mr. Obama said. "It has to be developed in an environmentally secure and sensitive way." Last month, an energy committee of Britain's House of Commons found there was no evidence fracking is unsafe. The chairman dismissed fears as - "hot air."